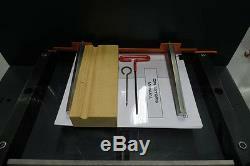 Challenge Spartan 150SA Paper Cutter. PICTURED MACHINE STAND IS NOT INCLUDED. SEE PRICING FOR THIS ACCESSORY BELOW. 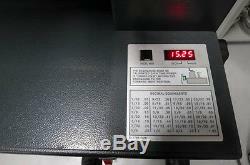 This Challenge Spartan 150SA paper cutter is a current model machine, in excellent condition, and has been completely refurbished by the PFS Challenge authorized technical team with years of experience and factory OEM parts when required. Includes pictured machine, manual, and knife changing tools. 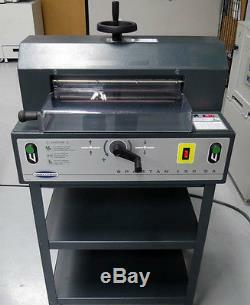 Refurbished PFS Challenge Paper Cutters (PDF Brochure). When comparing this machine to lesser priced units on the web, please consider that PFS is an authorized Challenge dealer and our trained and certified technicians have gone completely through this machinery to guarantee trouble-free performance for many years to come. If you require crating, transportation, installation, training, etc. This is our business and we know how to do it right the first time. PFS is based out of Orange County, California and Phoenix, Arizona, and we employ twelve very competent technician. PFS is your authorized RYOBI MHI, Horizon, Challenge, Perfecta, James Burn distributor, Secap, Accufast, MGI, Mimaki, and OKI Data distributor with local sales and service throughout California, Arizona and Nevada. YouTube Video Challenge Spartan 150SA. Challenge Spartan 150SA Setup Guide. 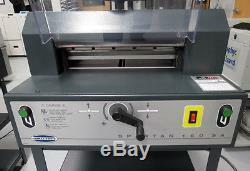 All OEM parts and supplies for this Spartan 150SA cutter, and all Challenge cutters are available through. Available Accessories for Spartan 150SA. Note: At the time of final invoice we will ask if you would like to have additional accessories added to your order. We have these items in stock at all times but it is a good idea to have a spare knife and box of cutting sticks. F e a t u r e s. Electric power - 1/2HP Gear Drive Motor. Hand crank wheel system provides over 200% more clamping force than the lever clamping system. RESULT - a better cut. Safety covers over the front table (the cutting area) and rear table. Requires the simultaneous use of both hands to operate. Heavy Duty Steel, Cast Iron, and Cast Aluminum Construction gives it "Challenge durability". Hardened steel components and bronze bearings on most wear surfaces increase the life of the machine. EXCLUSIVE SPARTAN 150 SA FEATURES. LED Digital Backgauge Position Display. The easy to read digital display located on the front table of the machine allows the operator to easily set the backgauge position accuratelyevery time. Twelve red LED lights positioned over the knife provides the brightest, most consistent and easy to see optical cut-line in the industry. Auto Releasing Front Safety Shield. Front shield automatically pops open after a cut cycle is completed allowing the operator to remove the cut stock without the extra step of having to manually open the cover. Virtually Maintenance Free Knife Bar Gibs. "Gibs" are devices used to control the knife position during a cut cycle assuring a consistent and accurate cut. Traditionally, these surfaces require routine lubrication because of the continuous surface friction they have with the moving knife bar. The Spartan 150 SA gibs however, are made of an advanced material called UHMW that is both strong and self-lubricating - resulting in virtually maintenance free durability. Table Space In Front of Knife. 1 Phase, 60 Hz, 120 Volt, AC Service Size: 15 Amps. Challenge reserves the right to make changes to any product or specification without notice and without incurring responsibility to existing units. Extended labor warranties available in most areas, please contact PFS directly for details. Actual listed machine pictured above is in the PFS showroom located in Phoenix, Arizona. We really want to sell this equipment!!! We really want to sell this equipment! I know you are going to Best Offer this one... We will beat any advertised price GUARANTEED and most likely any unadvertised price. Location and General Terms of Sale. This machine is located in Placentia, CA. About Print & Finishing Solutions. Our corporate office is based out of Southern California, but we have a second location in Phoenix, AZ to better service your needs. Contamos con agentes de ventas bilingües, técnicos del servicio mecánico y miembros del equipo de servicio al cliente. Asistencia en español está disponible en todos los aspectos en nuestra empresa. Para obtener asistencia en español, porfavor contáctenos por teléfono al. With this said, we will make every effort to assist you with professional support in the purchasing process. Party visit, please do so. Generally residential and lift-gate deliveries cost additional. 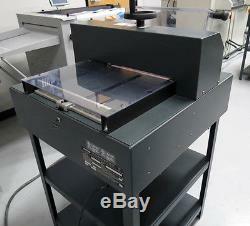 Graphic-Arts Bindery and Finishing Machinery for the 21st Century. Print & Finishing Solutions for the 21st Century. Two Facilities to Serve You. California/Corporate -1632 Sierra Madre Circle Arizona -4635 South 33rd Street. We would be happy to answer your questions and concerns about a wide range of products. New, used, and refurbished machines. Retail, wholesale, corporate, and government pricing. As your business partner, the success of Print & Finishing Solutions relies on the success of our customers and vendors. This philosophy is reflected in our motto, Taking care of your business is our specialty. Our team approach promotes an atmosphere of cooperation, and our primary goal is to work together for success. It is the goal of PFS to support our customers and their print-related machinery for the long term with intelligent, well-trained sales and service personnel. We have a complete line of presses and finishing equipment, including paper cutters, folders, drills, binders, collators, bookletmakers, cornerounders, hole punches, tabbers, joggers, punch and bind equipment, shrink wrap and packaging systems, staplers, stitchers, stock carts, padders, trimmers, perf / score / slit / number systems, and used machinery. Through the online program, customers can access the current BBB database to view the complaint history of businesses and check that a business has met all of the stringent BBB membership standards. The item "Challenge Spartan 150SA Paper Cutter Refurb Warranty Triumph 4315" is in sale since Tuesday, March 21, 2017. 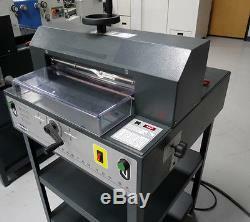 This item is in the category "Business & Industrial\Printing & Graphic Arts\Bindery & Finishing Equipment\Paper Cutters & Trimmers".used" and is located in Placentia, California. This item can be shipped to United States.